If you’ve backed up your iPod to a Windows Vista PC, the files from the iPod will be a jumbled mess — having lost all the original directory and filenames. Not to fear. Although your files look as though they’ve gone through a wringer, you can still restore the directory information for your iPod data. You can usually bring back the original filenames, too (or at least the track numbers and song names), the folder structure, and all the tags — the whole nine yards. Start iTunes. Choose Edit→Preferences, and then click the Advanced tab. The iTunes Preferences dialog box appears, with the Advanced tab active. 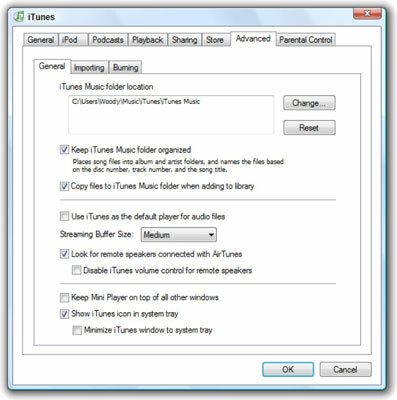 Select the Keep iTunes Music Folder Organized and the Copy Files to iTunes Music Folder When Adding to Library check boxes. Then click OK.
You might want to keep a record of what the original settings were so you can return them to their original values when you’re done reconstituting the iPod files. 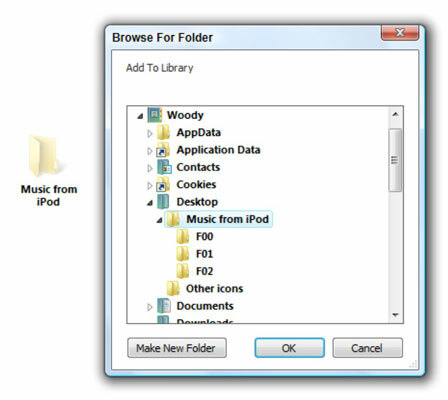 Click the Music from iPod folder and drag it onto the iTunes window. This should tell iTunes to add the music in the Music from iPod folder to the iTunes Library. If iTunes doesn’t start adding the music, try one of the following methods. Choose File→Add Folder to Library. Then navigate to the DesktopMusic from iPod folder. Click the OK button. If that still doesn’t work, go through each of the folders in the Music from iPod folder and either add them individually or select the files and drag them to the iTunes window. It may take awhile, depending on iTunes’ buggy behavior, but in the end, all your songs are copied to the iTunes library. Choose Start→Music, double-click the iTunes folder, and then double-click the iTunes Music folder. All your original music is there, neatly filed in the proper folders — the filenames should be set to track numbers followed by song names. If you like, you can click and drag the music folders out of iTunes’ clutches and put them anywhere you want to keep as backup. Treat them just as you would any other music file. To clean up after yourself, delete the Music from iPod folder on your desktop. Return iTunes to its original settings by repeating step 1 and then changing the settings to what they were before you completed step 2. Amazing how iTunes can be shanghaied to help you unscramble the songs you put on your iPod, eh?